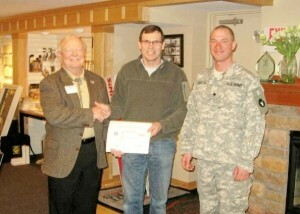 Above: Steve Schmidt, center, is presented the Patriotic Employer Award by MN ESGR representative, Norm Hecimovic, left. Guardsman SPC Nick Hegdal, right, nominated the company. Steve Schmidt, President of Schmidt Homes, Inc., Northfield was recently recognized as a patriotic employer by the Minnesota National Guard for his support of employee, SPC Nicholas Hegdal. Hegdal has been a carpenter for eight years and a member of the MN National Guard for six years. To recognize his boss and the company, Hegdal nominated the contractor for the Patriotic Employer Award, through the U.S. Department of Defense National Committee for Employer Support of the Guard and Reserve (ESGR). There are 460 soldiers from the 1st Battalion, 125th Field Artillery preparing for a one-year deployment in the Middle East, according to the National Guard. The soldiers will be responsible for providing base security and securing the convoys of troops, equipment and supplies throughout Iraq. Hegdal will be leaving May 15th for Kuwait, in support of Operation New Dawn. Employers are required by law to cooperate with employees in the Guard but not all employers have good attitudes about the hardships caused by an employee’s absence. Schmidt and his coworkers have all been very supportive of the time off needed for his military duties. “Nick is one of our best carpenters and will be greatly missed, but our main concern is for him and his family during the time he will be away on overseas’ duties”, Schmidt said. Hegdal and his wife, Melanie, live in Faribault.